4000: The development of organic molecules. 3900: Prokaryotic cells (resembling early bacteria). 2500: First organisms to use oxygen. 2100: Eukaryotic cells (more complex single celled organisms). 1200: Evolution of sexual reproduction—recombination allows for faster evolution. 600: The earliest multicellular organisms evolve. These were thought to be a primitive type of sponge. 580: Cnidarians—the first organisms with nerves and muscles—may have been the first multicellular organisms with movement. 550: Flatworms—the first animals to evolve a brain. 530: Pikaia, a type of worm, was the first animal with a notochord (a primitive type of backbone), and is thought to be an ancestor of all vertebrates. 505: The first vertebrates—a species of jawless fish related to modern lampreys. 480: Placodermi, the first species of jawed fish. 400: Coelacanth—the “living fossil,” so-called because the species is still in existence today. 375: The first lobe-finned fish. 365: Some species of freshwater lobe-finned fish develop legs, evolving in shallow-water and swampy habitats. Lungfishes retain some characteristics of these early tetrapods. 315: The first known animal with recognizable limbs—Acanthostega—is believed to be the first capable of coming onto land, but it was poorly adapted for this habitat. 300: The earliest known reptiles were around eight inches in length. The amniotic egg allowed the evolution of reptiles which could reproduce on land. 265: Two branches of reptiles split off. Diapsida evolved into modern reptiles. The other, called Synapsida, evolved into the earliest mammal-like reptiles, known as Pelycosaurs. These evolved into Therapsida. 220: A subgroup of Therapsids called the cynodonts began to evolve more mammalian characteristics, including jaws which more resemble those of modern mammals. 220: One group of cynodonts is thought to contain a species which is a direct ancestor of all modern mammals. These early mammals were small and fed mainly on insects, and likely had milk glands and a constant body temperature. The neocortex (the newest part of the cerebral cortex) evolved in these first mammals. 65: A group of nocturnal, insect-eating mammals begins to split off into three distinct groups, one of which will evolve into primates. 40: Primates split into two groups: Strepsirrhini and Haplorrhini. The latter includes apes, monkeys, and tarsiers. 30: Haplorrhini splits into two groups— Platyrrhini and Catarrhini. Platyrrhini migrated to South America, becoming the New World monkeys, while Catarrhini remained in Africa. 25: Catarrhini splits into two groups—the Old World monkeys, and the apes. 15: The apes split into Hominidae (which will become the great apes—orangutans, chimpanzees, gorillas, and humans) and the gibbons (lesser apes). 13: Speciation (evolutionary divergence) of orangutans. Pierolapithecus catalaunicus, thought to be a common ancestor of gorillas and humans, had a wide, flat ribcage, stiff lower spine, flexible wrists, and flat shoulder blades, all adaptations which helped the animals climb trees. 7: Speciation of chimpanzees. The last common ancestor of humans and chimpanzees is Sahelanthropus tchadensis. The so-called “Millennium Man,” Orrorin tugenensis, is the earliest known human ancestor which post-dates this speciation. 3.7: Australopithecus afarensis leaves footprints on a layer of volcanic ash in Laetoli, Kenya. These footprints indicate that the species was most likely bipedal. 3: The evolution of the bipedal australopithecines in the African savannahs. Over the next million years this hominid species loses its body hair as it becomes fully bipedal. 2.5: The genus Homonids appears, evolving from australopithecines ancestors. This development coincides with the appearance of tools in the fossil record. 1.8: The evolution of H. erectus, in Africa. This species resembles modern humans and is thought to be an ancestor. 1.5: Human ancestors began to use fire as a tool. 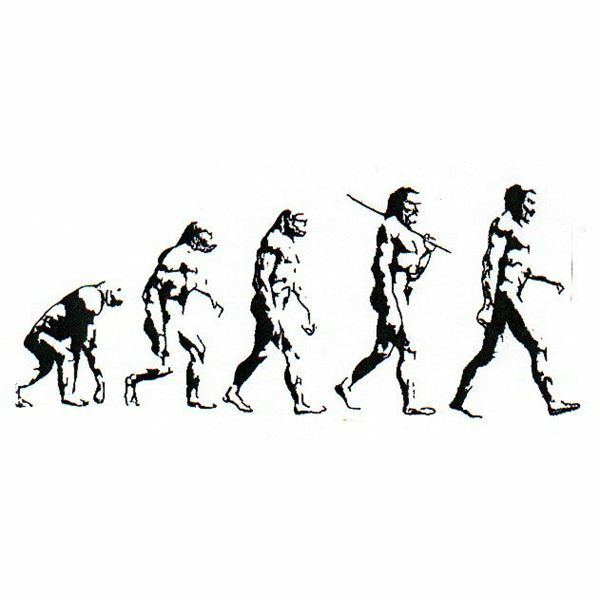 700: A common genetic ancestor of Neanderthals and humans is thought to have lived at this time. 355: H. heidelbergensis, common ancestor of humans and Neanderthals, leaves footprints in a layer of volcanic ash in Italy. The species was similar to H. erectus, but had a larger brain-case. 195: Omo I and Omo II, two fossil specimens discovered in Ethiopia, lived at this time. They are the earliest discovered fossil evidence for ancient H. sapiens. 160: H. sapiens living in Ethiopia near the Awash River are known to have practiced mortuary rituals. 150: The woman known as “Mitochondrial Eve” lived at this time, in East Africa. This fossil is the most recent common ancestor of human females. 70: The development of genes associated with speech. The development of “behavioral modernity,” a set of behaviors and traits associated with modern humans. At around this time, the development of modern human culture began to accelerate rapidly. 60: The “Y Chromosomal Adam” lived in Africa. This fossil is the most recent common ancestor of human males. 50: Humans begin to migrate to South Asia. 40: Humans begin migrating to Europe and Australia. 25: The Neanderthals die out. 12: With the extinction of H. floresiensis, H. sapiens becomes the only living species of Homonids. 10,000 BCE: Humans begin to develop farming in the “Fertile Crescent,” a highly fertile crescent-shaped region in the Middle East which includes Ancient Egypt, Ancient Mesopotamia, and the Levant.